Simone Ferrarese set about day one of Stena Match Cup Sweden with some giant killing. 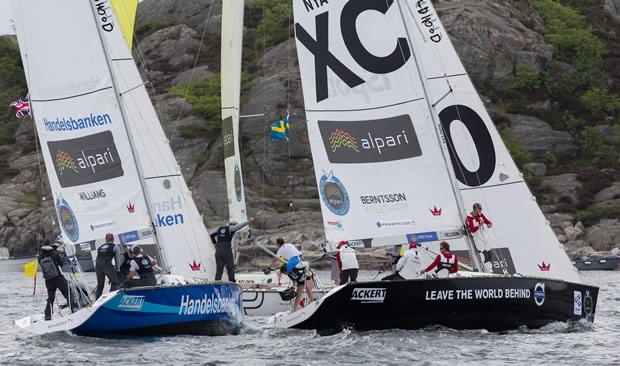 The Italian is making the most of his wild card to this event, the third of the season on the Alpari World Match Racing Tour, notching up four wins and just one loss from his first day at Marstrand. The first upset came early, with the 25-year-old Italian beating reigning World Champion Ian Williams and GAC Pindar in the very first flight. Then came victories over Keith Swinton’s Black Swan Racing and Taylor Canfield’s USone. Ferrarese’s good run was finally broken by local crew, Johnie Berntsson’s Stena Sailing Team, but the Italian immediately bounced back with a win against Adam Minoprio and Team Alpari FX. Ferrarese’s strong showing was impressive, although it’s Williams that tops the leaderboard with five wins from six matches. The only skipper to have kept a clean sheet thus far is Phil Robertson and WAKA Racing, but the young Kiwis have only raced four matches so lie 2nd in the standings. Berntsson sits in 4th overall, just behind the Italians whom they beat today, along with Pierre Antoine Morvan and the Vannes Agglo Sailing Team. The local sailor lost to Williams and fellow Swede, Bjorn Hansen and eWork Sailing Team. Berntsson will be looking to exert his local advantage more than he did today. “It is quite shifty and puffy conditions for all the teams, but there are patterns to be found too,” said Berntsson. Tonight is the opening ceremony and welcome dinner, with Qualifying continuing tomorrow.